CPI state secretary Kanam Rajendran fumed at chief minister Pinarayi Vijayan for convening a high-level meeting on the Munnar eviction process without the knowledge of the Revenue Ministry. KOTTAYAM: CPI state secretary Kanam Rajendran fumed at chief minister Pinarayi Vijayan for convening a high-level meeting on the Munnar eviction process without the knowledge of the Revenue Ministry, which is held by his party. The meeting cannot take a decision on a matter that is under the consideration of the High Court, he said. However, the chief minister drove on with his meeting on the Munnar issue Saturday, paying no heed to the CPI’s boycott of it, and presided over a decision to collect tax from all but one 113 kuthaka pattam land holders in Idukki. Revenue minister E Chandrasekharan of the CPI stayed away from the meeting as his party opposes revenue rules being cast aside to accommodate encroachers. Responding to media personnel on the sidelines of a meeting of the Progressive Federation of College Teachers (PFCT) in Kottayam Saturday, Kanam Rajendran trashed the meeting: “What is the purpose of this meeting and what relevance does it have? Several discussions have already taken place in the Munnar issue. We have laws here. Anybody can convene meetings and anyone can attend meetings. However, things can be done as per law only,” he said. Sending a strong message that the CPI, an ally of the CPM in the ruling Left Democratic Front, would not back off on the Munnar eviction proceedings, Kanam said eviction notice sent to an encroacher in Munnar cannot be withdrawn. “After sending an eviction notice to a party, if somebody demands to repeal it, we cannot comply. When the case is due to come up in court on Monday, how is it possible for a third party to take a decision on it?” he said. 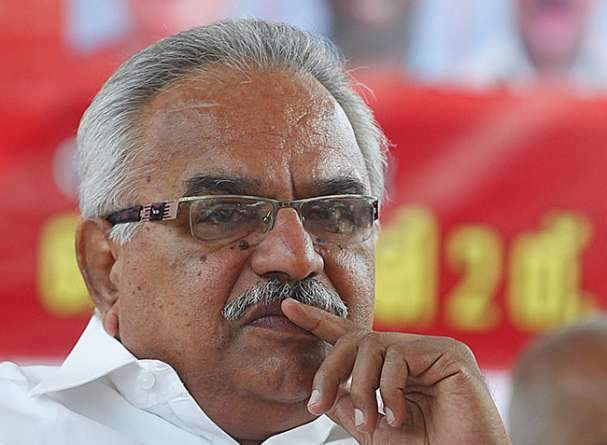 Kanam Rajendran added that the CPI will not interfere in the working of ministers.